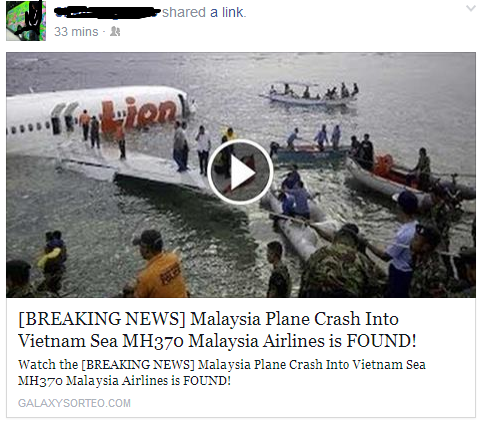 A false news encircling around social media about the Missing Malaysia Flight MH370 that been Found in Vietnam Sea. 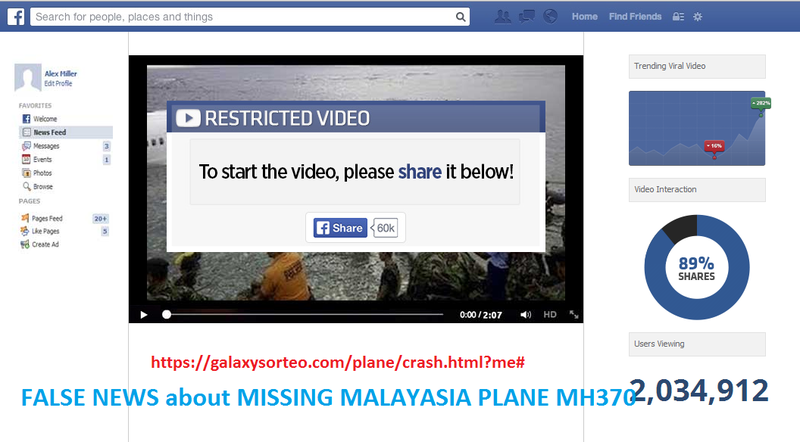 On the link thumbnails shows an static image that its looks like a preview of a video showing that people are rescuing the passengers of the missing airplane which are 100% fake. Read the real news here. Its been shared on Facebook timeline wherein you will be asked to share the link first before you can access the video of said found missing Boeng 777 and the rescue operation that has been done which makes the false new viral on Facebook. Don't be fooled with this tactics of those webmasters out there to gather visitors on the link to earn from their ads installed on the site link and may hacked or gather your Facebook details or information (not yet proven) if you share or click on that link. This is one of the old tactics that fools everyone in relation with viral news of the given time. Do not click on the link if sees about the false news. Be vigilant and and avoid this type spam link on Facebook. Once you click on the link you will be redirected on the page where you are required to share the link first before you can view the content of the link same as shown on the image below. The best thing to do on this type of spam links or false information is to report as spam link on facebook to avoid being victim of hacking or misused of your facebook personal account information (if the said link are used to gather information of facebook users who shared the link). Inform you friends about this link and help them to avoid the spam.